Ben Lewis & Kelly Mathieson in "The Phantom of the Opera"
It’s a busy time for Australian performers in Andrew Lloyd Webber musicals in London, what with Anna O’Byrne appearing in the new revival of The Woman in White and Ben Lewis, her former co-star from the Oz premiere of Love Never Dies, starring a few streets away in the title role of The Phantom of the Opera at Her Majesty’s Theatre. Broadway.com caught the charming Lewis early one recent evening to talk iconic roles, stage sequels and memories of Michael Crawford. Do you feel like a part of history, stepping into this role in this production, which has been running at the same West End playhouse for over 31 years? I think doubly so playing the Phantom here at Her Majesty’s where essentially the show is running just as it did in 1986. If you were to create this show today, most of it would be done with automation and a handful of people pressing buttons, but instead we’ve got a 20-strong crew and half a dozen stage managers and all of the candles are hand-cranked from underneath the stage by people down there: this is a pretty remarkable thing to be a part of. So, this isn’t just any ordinary long-running show? I can’t imagine the likes of The Phantom of the Opera will ever happen again in terms of a show that has been written by the theater landlord and that is full every night so that they’ll never move it. I can’t see a world where this sort of thing will happen anymore. How is it that you can claim to have seen Michael Crawford’s career-defining turn as the Phantom? You must have been very young! We were living [in London] for a little while at the time. I can’t say I have any specific memories of Michael’s performance, but I do remember the chandelier and the boat and things like that. It would have been one of my first theatrical experiences. Had you at least sung some of this score before, perhaps when you were appearing at the Menier Chocolate Factory here in Forbidden Broadway [in 2014]? Not a note, not even an audition; I came to it very fresh. Damian Humbley played the Phantom when we were doing Forbidden Broadway, which I think came down to logistics; I was busy changing costumes at the time. Did this job feel like a date with destiny? I never thought I wouldn’t want to do it, if I can put it like that [laughs]. I relate strongly to the character, so it wasn’t a question of not wanting to do it; it was more about timing. My wife [Melle Stewart] is an actress as well, so having packed up and moved from Australia to the other side of the world to a new city [London] where essentially the industry doesn’t know you meant that it seemed a good idea to do shorter runs of shows in visible arenas where we could meet people and have people see what it is that we do and what we bring to our work—places like the Chocolate Factory, where I did Forbidden Broadway and Candide, or Chichester and Sheffield, where my wife has performed. Was Phantom the right gig at the right time? That’s right. Having built our network here from the ground up after five and a half years, I heard that there was a re-cast for the show coming up and it felt like the right time to put my hand up. And I would never have put my hand up if I felt I couldn't commit heart and soul to the job. I’m lucky enough, too, to have the British passport, so I feel very much part of the industry now. Did your predecessor in the role, Ben Forster, give you any tips? I spent some nice time with Ben before he left the production shadowing him backstage, and he definitely gave me some pointers and technical things that I have carried on with. What’s most extraordinary is that if you look at the mirror next to my makeup chair, it’s covered with Polaroids of 25 years’ worth of Phantoms: the show’s history quite literally is on those walls. What was it like coming to this having played an older version of the same character in the Australian premiere of Phantom’s sequel, Love Never Dies? The biggest difference, and the way I can best express it, is that whereas Love Never Dies is like a marathon, Phantom feels like a series of sprints. 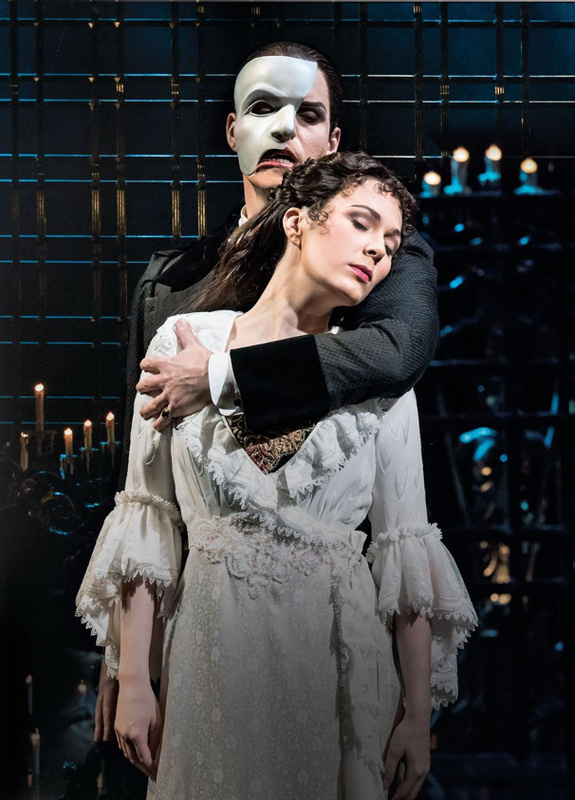 In this show, the Phantom is on and offstage but when he is on, it’s 150%—the intensity and level of commitment required are high every moment that he’s onstage. There isn’t a moment where he’s part of a group scene or standing around in a crowd. That’s not the case, is it, with Love Never Dies? The Phantom is a constant presence throughout Love Never Dies: he must be there at least 85% of the time. In Phantom, by contrast, I listen to “Prima Donna” every night up in the flies, and my great sadness is that I don’t get to join in with the amazing singers who are part of the show; in much the same way, the Phantom appears in “Masquerade” as an apparition and then disappears again. Did a theatrical career for you feel preordained? Both my parents are opera singers, which means that I basically grew up in a fairly liberal environment where my day care center when I was young was the theater. I have memories as far back as I can remember of being in and around various theaters around the world, so it has always felt like a natural environment to be in. Wasn’t your brother [Australian tenor Alexander Lewis] at one point a Phantom? His first job professionally was as Raoul in Australia and he covered Anthony Warlow as the Phantom, so the last time I actually saw the show live was watching my brother do his first Phantom, which must have been about 2007. That was quite bizarre, and it also means that it has been a long time since I have seen the show from out front. What is it about Love Never Dies that has resulted in that show being a trickier entity for audiences and critics than Phantom? I can only speak to our production in Australia which I believe is currently touring the States, but even before we opened our version, there was stuff in the press saying, “Don’t do it, you shouldn’t be doing it.” But I felt that we needed to do it and that we proved everyone wrong. I loved Love Never Dies, absolutely loved it, and am just thrilled that our production gained traction and is being seen. Why, meanwhile, do you think it is that Phantom endures? It remains one of the first big-budget spectaculars that really grabbed people’s attention, and on top of that you’ve got Andrew’s amazing music, Hal Prince’s incredible direction, which has stood the test of time, and Maria Bjornson’s remarkable design: I think this show is the perfect storm.